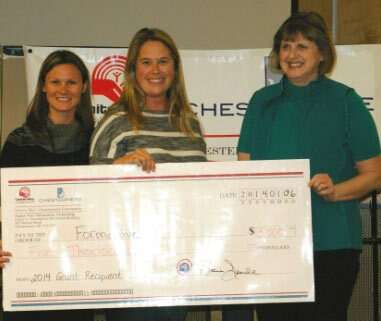 The United Way, in partnership with the Town of Chestermere, helps to support local community initiatives by investing in programs that address the most pressing issues within the town. Funds raised through the United Way (UW) Calgary and area annual campaign as well as local campaigns such as the ‘Art de la Rue’ Wine & Cheese fundraiser held in September were doled out on Monday, January 6th at Town Hall to local groups who met the UW Funding Guidelines and Criteria. Each year, the volunteer committee that represents this partnership accepts applications from local not-for-profit groups and then, following funding guidelines, they carefully determine which organizations are best suited to receive funding. 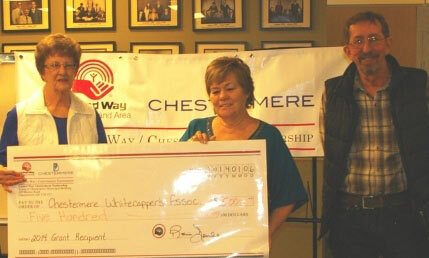 According to Jeanette Bailey, Community Services Administrative Coordinator for the Town of Chestermere; in October the UW/Chestermere Partnership received seven applications for funding. “In November, the Partnership Committee narrowed it down to 5 but then recommended that one of the groups apply through FCSS instead as their project was very well suited to the mandate of FCSS,” said Bailey, “The formal presentations were done in December with decisions for funding being made mid-December.” In the end, four community groups received funding from the UW/Chestermere Partnership and one received funding from Family and Community Support Services (FCSS). The five recipients of the 2014 grants were: Formative 5 Coalition; Camp Chestermere; Chestermere Whitecappers Association, Accredited Supports to the Community and Lake Ridge Community Church. The Formative 5 Coalition was granted $5,000 that will be put toward their Early Childhood Community Education Project. The project will create practical “tool kits” for families that will promote activities centered on the 5 domains of development; this tool kit would be designed to encourage parental/caregiver involvement in early childhood activities. 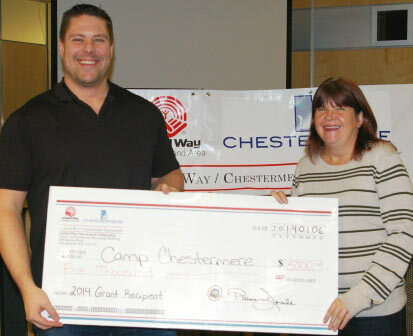 Camp Chestermere received $5,000 toward their Camp Sponsorship Program. This program will allow for children and youth to be sponsored so they can experience a week of camp when they would not otherwise be able to do so because of financial constraints. Accredited Supports to the Community also received $5,000 for their Healthy Families Program. The goals of the program are to assist parents in gaining knowledge and building capacity to provide positive parenting to their own families, provide community and social connections to support child development and wellbeing as well as assist in creating positive changes for families. Chestermere Whitecappers Association received $500 for their Seniors Quilters Club. The Quilters Club will use the funds to purchase supplies and machinery in order to produce quilts which are then donated and used to show compassion and support to the victims of crime, tragedy, domestic violence in Chestermere and area through the RCMP – Victim Services and the Community Crisis Society of Wheatland. 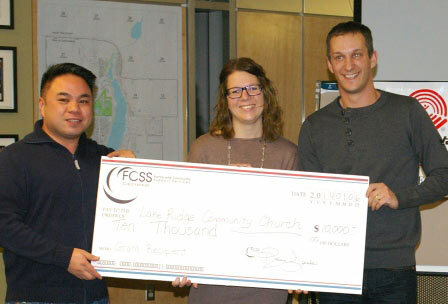 Finally, in addition to the grants awarded by the UW, another endowment was presented by the of SE Rocky View to Lake Ridge Community Church for their Mighty Neighbourly Project. $10,000 was given to the Church group for the unique project which is designed to engage people in the community as soon as they move here, as well as assist those individuals or families who need a home cooked meal due to a particular situation where there is an expressed need for care. “Congratulations once again to Camp Chestermere, Accredited Supports to the Community, Formative 5, The Whitecappers, and Mighty Neighborly. We look forward to hearing about your successes throughout the year”, said Brookhouse.